The Porsche 956/962 was quite possibly the greatest sports racing car ever built, absolutely dominating Group C competition in the 1980s. So why is someone debuting a 962 in 1993? Well, this isn’t a Porsche 962, it’s a Dauer 962, done up by a privateer named John Dauer as a homologation special for GT1 racing, the top class at Le Mans after Group C blew itself up for a variety of reasons. You see, Porsche built so many 962s for privateers to run at Le Mans that it was basically a GT1 car already, kind of like the GT40 in the late ‘60s. Again, this was just a Porsche 962 with whatever it needed to be road legal. As such it has the same twin-turbo flat six as the 962 race car, only unrestricted up to 730 horsepower as Dauer claims. Top speed was 251 mph, or 404 km/h, per Dauer. 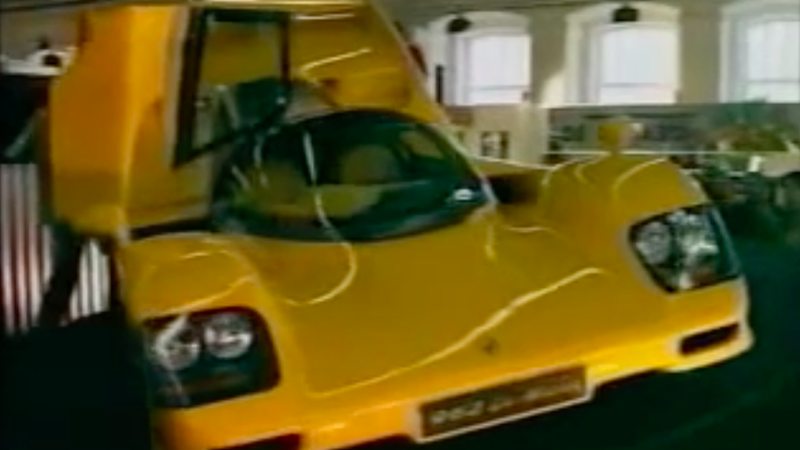 This was the Dauer’s debut at the 1993 Frankfurt International Motor Show, a video I bumped into while looking up info on something else entirely. Everyone seems to be in a quite cheery mood, with some wonderfully huge bottles of champagne at hand. They had every right to be happy. Dauer would run the 1994 24 Hours Of Le Mans and won it outright, making the car a solid contender at the greatest race in the world for a solid decade. Worthy of champagne, I’d say.